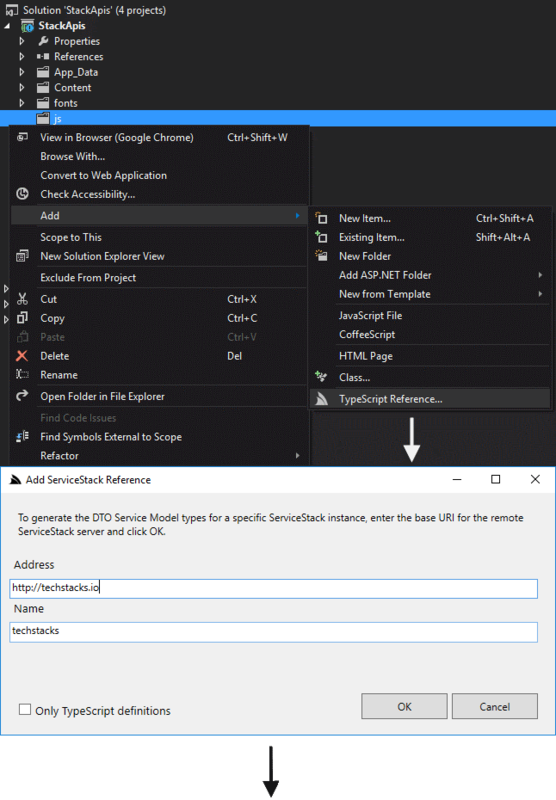 ServiceStack's Add ServiceStack Reference feature allows clients to generate Native Types from directly within VS.NET using ServiceStackVS VS.NET Extension - providing a simple way to give clients typed access to your ServiceStack Services. We're actively tracking TypeScript's evolution and looking forward to integrating TypeScript 2.0 once it leaves beta. The TypeScript JsonServiceClient available in the servicestack-client npm package enables the same productive, typed API development experience available in our other 1st-class supported client platforms. Where the r param in the returned then() Promise callback is typed to StoreGistResponse DTO Type. The easiest way to use TypeScript with ServiceStack is to start with one of ServiceStackVS TypeScript projects. 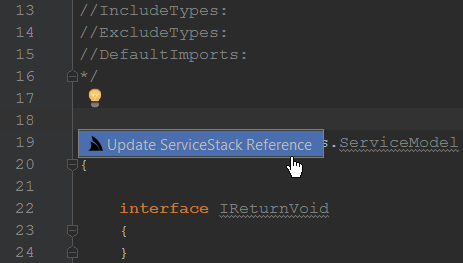 The easiest way to Add a ServiceStack reference to your project is to right-click on a folder to bring up ServiceStackVS's VS.NET context-menu item, then click on Add -> TypeScript Reference.... This opens a dialog where you can add the url of the ServiceStack instance you want to typed DTO's for, as well as the name of the DTO source file that's added to your project. If your server has been updated and you want to update the client DTOs, simply right-click on the DTO file within VS.NET and select Update ServiceStack Reference for ServiceStackVS to download a fresh update. Looking at the types we'll notice the DTO's are plain TypeScript Types with any .NET attributes added in comments using AtScript's proposed meta-data annotations format. This lets you view helpful documentation about your DTO's like the different custom routes available for each Request DTO. By default DTO properties are optional but can be made a required field by annotating the .NET property with the [Required] attribute or by uncommenting MakePropertiesOptional: False in the header comments which instead defaults to using required properties. Making API Requests in TypeScript is the same as all other ServiceStack's Service Clients by sending a populated Request DTO using a JsonServiceClient which returns typed Response DTO. In most cases you'll just use the generated TypeScript DTO's as-is, however you can further customize how the DTO's are generated by overriding the default options. The header in the generated DTO's show the different options TypeScript native types support with their defaults. Default values are shown with the comment prefix of //. To override a value, remove the // and specify the value to the right of the :. Any uncommented value will be sent to the server to override any server defaults. The DTO comments allows for customizations for how DTOs are generated. The default options that were used to generate the DTO's are repeated in the header comments of the generated DTOs, options that are preceded by a TypeScript comment // are defaults from the server, any uncommented value will be sent to the server to override any server defaults. This lets you know what Version of the Service Contract that existing clients are using making it easy to implement ServiceStack's recommended versioning strategy. By checking Only TypeScript Definitions check-box on the dialog when Adding a TypeScript Reference you can instead import Types as a TypeScript declaration file (.d.ts). If you're publishing a DTO Type for your Server Events message you'll also be able to benefit from the generated Type definition like Gistlyn does with ScriptExecutionResult. ServiceStackIDEA is a plugin for JetBrains IntelliJ based IDEs to simplify development of client applications for ServiceStack services with integrated support for Add ServiceStack Reference feature. 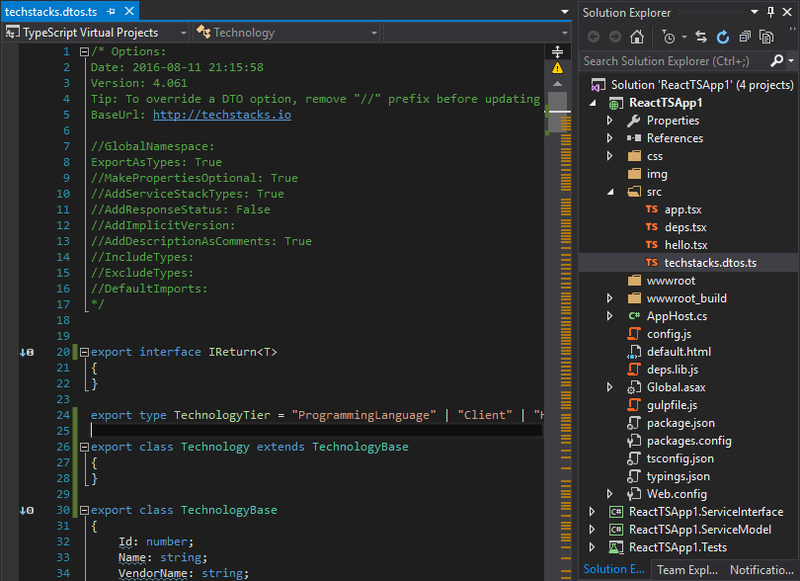 By right clicking on any folder in your Project explorer, you can add a TypeScript reference by simply providing any based URL of your ServiceStack server. Once this file as been added to your project, you can update your service DTOs by right clicking Update ServiceStack Reference or using the light bulb action (Alt+Enter by default). 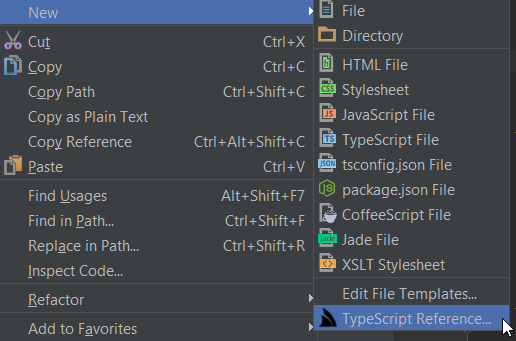 This now means you can integrate with a ServiceStack service easily from your favorite JetBrains IDE when working with TypeScript! What is a message based web service?